Spray 4-quart slow cooker with cooking spray. In 2-quart saucepan, melt butter over medium-high heat. Add onions, pepper and salt; cook 3 to 4 minutes, stirring occasionally, until tender. Stir in flour. Cook 1 minute, stirring constantly. Gradually stir in evaporated milk until smooth. Pour mixture into slow cooker. Stir in broth and thawed broccoli. Cover; cook on Low heat setting 4 to 4 1/2 hours or until hot but not simmering. Add cheese cubes to slow cooker; stir until melted. Add 1 1/2 cups cheddar cheese and the Parmesan cheese; stir until melted. Sprinkle individual servings with additional cheddar cheese. The base of the soup is a classic white sauce, but it’s being made in slow motion—thickening up over the low heat of the slow cooker. It’s convenient to use the frozen broccoli florets, but feel free to use fresh broccoli—including peeling and slicing some of the stalks and stirring them in. Using some processed cheese with the natural cheeses helps keep the soup smooth, since sharp cheddar can separate when heated. If you want to reheat any leftovers, do it over low heat, or use the microwave on a low setting, being careful not to boil it. Cut up a loaf of grainy sourdough bread into 1/2-inch cubes. Toss cubes with some melted butter and a sprinkle of dried basil and garlic salt. Spread out on rimmed baking sheet, and toast at 375°F until they’re golden croutons. Spoon some into each bowl of soup. Want to take a slow-cooker meal to a party? Wrap the slow cooker in a towel or newspaper to keep it warm. Attach rubber bands around the handles to secure it for travel. For easy cleanup, coat the inside of the insert or cooker with cooking spray. Slow cookers work most efficiently when they are two-thirds to three-fourths full. This recipe has become a go-to for cooks who observe meatless Mondays, who want a quick-prep option for a satisfying weeknight dinner or who want to recreate the taste of their favorite restaurant broccoli cheddar soup right at home. One of this soup’s reviewers said, “I can't get enough of this recipe … it is outstanding,” which pretty much sums up the way you and your family will feel about slow-cooker broccoli cheese soup. 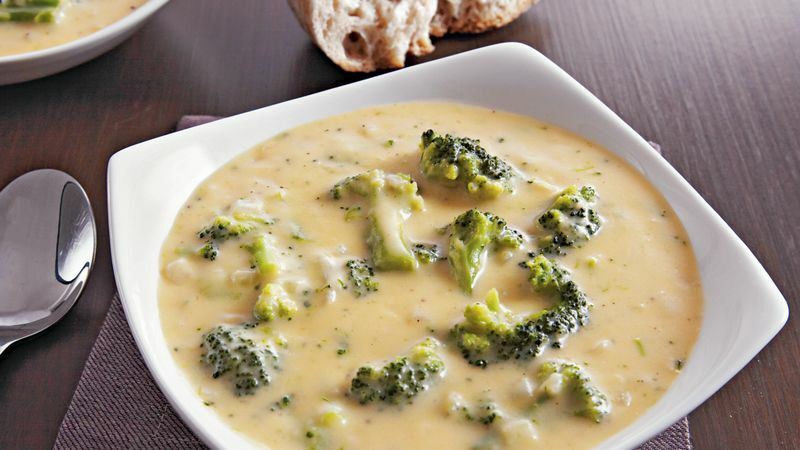 The three cheeses called for in broccoli cheddar soup for the slow cooker each play a part in making it so tasty. Kraft™ Velveeta™ Original cheese adds creaminess, extra-sharp cheddar cheese adds snap, and Parmesan cheese provides those satisfying umami flavor notes. To add more broccoli to your meals, find traditional favorites, quick-and-easy shortcuts and fun new twists at Betty’s Best Broccoli Recipes.